The primary consideration of Tokyo IT is to implement correct and useful social media strategy. As a professional, we offer to work with you as a Social media manager, consultant, and advertiser. We undertake your entire social media obligation from scratch and help to achieve your business goals. We assure you to leave no stone unturned to keep your business mighty in the social presence at a very affordable price. With trillions of people snuggling on their smart phones, scrolling thousands of websites it has somewhat become mandatory for every business organization to promote their services in social media platform. Due to active range of people in electronic dais it is indeed an interesting platform for business. It can take justified advantages from the web surfing population through social media marketing and reach out for large audiences all over the world. WHY SOCIAL MEDIA IS A MUST FOR EVERY BUSINESS SERVICE PROVIDER? Brand Awareness: Relevant content will create brand awareness and increase brand visibility. Brand Reputation: Quick response to industry development and public relations. Cost Effective: Cheaper way to promote business activities. The cost of maintaining and advertising in social media is minimum. Web Site Traffic: As the users in social media are in massive amount, you can easily boost traffic to your website. This allows online conversion such as sales and leads. Evaluation: One can set up tracking to determine sale generation along with the traffic measurement. Customer Interaction: Immediate response to customers both negative and positive feedback. Target Audience: If you are targeting professional clients you can use LinkedIn. If you are targeting young generation Instagram and Snapchat can be the best platform. If you are targeting average customers from all the backgrounds then Face Book is the best media. Loyalty: You can build relationship with customers through several social media, which allows you to increase loyalty and brand advocacy. 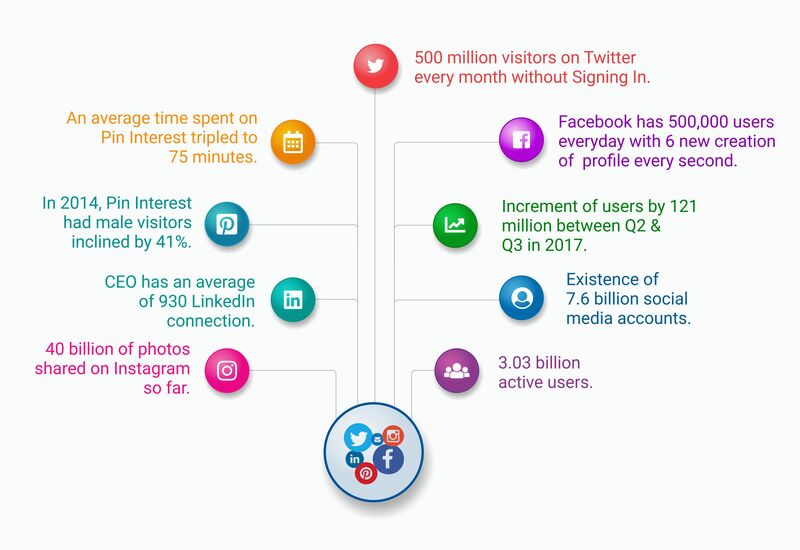 There are near about more than 3.03 billion of active users in all the social media. Despite having an active user of 3.03 billion there exists 7.6 billion of social media accounts. During the second quarter and third quarter in 2017, the users are increasing by 121 million every day. Every day Face Book has 6 new profile created every second while it has more than 500,000 users daily. There are more than 500 million Twitter visitors who visit Twitter without signing in. So far 40 billion of photos are shared on Instagram so far. On an average a company CEO has 930 LinkedIn connections. By 2014, the male visitors in Pin Interest had inclined by 41% making them stick to the page for 75 minutes. Well, the facts and figures surely has cleared the air on making optimum use of social media platform to uplift your business. This is a sure shot channel which allows to you to get closer access to your customers and retain a healthy relationship with them. Basically, it’s a cost-effective channel which allows you to drive more revenue to your business at a minimal cost. SO, MAKE SURE TO USE SOCIAL MEDIA TO EXPAND YOUR BUSINESS! Create and manage all the social media profiles on behalf of any organization. Formulate social media strategy to get social media marketing right. Proper social media management through constant monitoring, advertising and weekly reporting. Setting Social Media training and support to promote business in Social media platform. Build Social Media influencing strategy to outreach the business brand. Social media advertisement on Twitter, Facebook, Instagram on behalf of organization. Launching of Social Media campaign through right approach. Develop Healthy Customer relationship via two-way communication. Enhance the flow of website traffic through a social media campaign. Contact Us to serve you as Social Media Marketers!